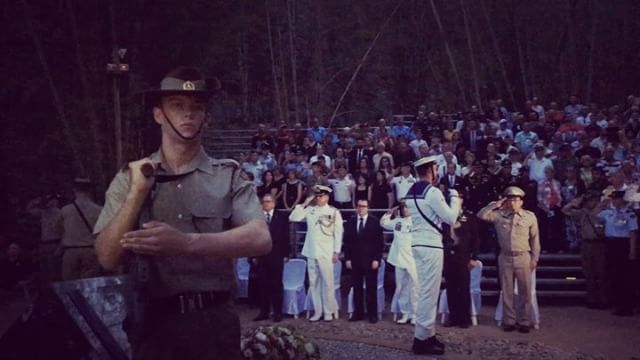 ANZAC Day dawn service at Hell Fire Pass. The sun was just rising and the birds started to sing……goosebumps. To get to the Pass we had to descend 140 stairs and walk the rocky trail of the old rail line in the dark. You can almost hear and feel the clanking of the pick axes as the soldiers worked. Previous Previous post: It was an early morning 3am. It was close to 40 degrees and the humidity was off the charts. This little guy did us proud. He is standing in front of Sir Edward Weary Dunlops memorial in Hell Fire Pass. Next Next post: We are home in Bangkok relaxing with a cup of tea and the best ANZAC biscuit I have had in two years (the only one but it's good).